One of the main reasons why you created a business website, or a social networking page for your company, is so that you can get more exposure for your products. Reinforcing your brand’s identity can be as simple as establishing an online presence, but to do this, you first have to learn a few tricks of the trade, like SEO. SEO is important in getting your brand out there with the help of search engines. Best practices encourage you to optimize your site so that search engines like Google will deem your website relevant to the keywords searched. Thus, your site has a good chance of getting a high ranking on the SERPs. On the other hand, if you want a guarantee that your website or your advertisements will make it to the top of the SERPs, then PPC is an ideal technique you need to consider. PPC, or pay-per-click advertising, is a marketing technique where you pay to be able to place your advertisement or a link to your website at the top or side of search engine results as well as partner websites that use their PPC platform. A form of PPC is search engine advertising or “search engine marketing” which you will normally hear as SEM. It’s where you pay for an ad placement on search engine results pages. So when a person makes a search using keywords that match your business’s ad, then your advertisement will also appear on the SERP. Ads Can Show At The Top and Side Areas. The Top Being the More Desired Spots. As you can see, the ads that are related to the keywords searched for, in this case “PPC Ads”, are positioned at the very top of the page, before the organic result from Wikipedia at the bottom of the picture. You can also see ad placements at the right side of the image. Now, when a person clicks on your advertisement, you will be charged a fee that you give to the search engine that brought back your link. So the question now is how much you’re going to pay every time your ad is clicked. Usually, the cost of PPC is calculated by the advertising fee divided by the number of clicks that your ad gets. On the other hand, there are other ways by which the cost is calculated, namely: flat rates and bid-based costs. In the case of the flat-rate model, the advertiser and the publisher already agreed to a fixed rate for the clicks generated. Usually, the publisher gives the advertiser a PPC card. As for the bid-based model, the advertiser first needs to engage in an automated bidding war with other advertisers who want the ad space on the page or the website.The bidder would tell the host how much he’s willing to pay for the spot, as well as the keyword that he wants to use on the ad. These factors will then be looked at by the “host” of the auction, and the advertiser with the best Ad Rank will get the spot. Ad Rank is what you get when you multiply the amount you’re willing to spend for the ad by your site’s quality score. Your quality score is the mark that search engines like Google, will give your site based on it’s relevance to a searched keyword. 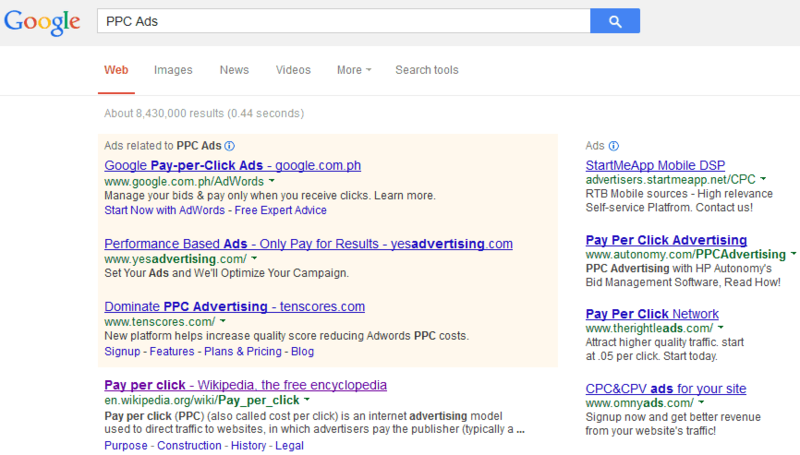 These auctions are usually done to get a placement on the SERPs and for Google, it’s called Google AdWords. You can find out how AdWords works during these bidding wars here. Aside from Google AdWords, there are plenty of ad networks where you can get a placement for your ad to give your business more exposure. Google also has AdSense, which you can consider if you want your ads to show up on specific websites, instead of just the SERPs. Yahoo! has an Ad Manager and other ad solutions that will allow you to place ads on mobile searches, and Bing has Bing Ads. Yahoo! and Bing also share an ad network called the Yahoo Bing Network. You can also use PPC ads on social networking sites like Facebook to get more likes, comments, and shares, and on Foursquare to increase check-ins and visibility. The middle one can seem pretty gruesome if you haven’t read the body of the article. In the previous section, you learned that PPC advertisements also make use of keywords that will ensure that your ad will be brought to the SERPs any time your chosen keywords are searched for, as well as when the content of your ad is relevant to what is searched. Since you also learn that SERPs use bidding wars to choose what ad goes where, you will need to know how to bid on the appropriate keywords for your ad. How do you do this? Choosing keywords goes beyond coming up with groups of keywords at the top of your head. The process requires time spent on keyword research, which will net you the actual keywords that people search for, and at the same time make sure that these are relevant to your content. Advertisers would often take advantage of tools that will help them look for these keywords. You can take a look at some of the best tools by reading this. Keyword grouping and organization is also tackled in that article, wherein you will find it’s important that your keywords are grouped in such a way that they can point to something specific, and yet will still sound natural and relevant when fitted in a sentence or phrase. With an organized structure of keywords, there’s less danger for you to overuse your chosen keywords and be judged as a spammer. You will also learn what keyword groups will be most useful for particular ads. With PPC, you also need to determine the keywords that you won’t use for SERP purposes. These are called negative keywords, and indicating these will tell search engines, like Google, that you don’t want your site to be associated with certain keywords, whose context and usage may not be relevant to what your page has to offer. This is to decrease the chance that people would click on your ad, when your landing page doesn’t contain anything that they’re looking for. Thus, you just paid for that click without gaining a potential customer. Finally, you need to optimize your keywords because you would only want to use the best keywords that will generate more clicks and thus, more traffic to your page. Remember that if you want a spot on the SERPs, you need to bid for it. Knowing the keywords that work will prevent you from gambling on keywords that you’re not sure will perform to your advantage. See those Snippets below the last 2 ads? They WORK. Here, you can see the ad starts with a “Headline” (blue) text. The description (black text) can be up to 2 lines. They serve as a summary of what’s in store for the searcher, helping him determine if the content is relevant to what he’s looking for. By optimizing your text ads, you will increase your quality score and get higher click-through rates. When writing your text ads, you need to remember that keeping it short and simple is the way to go. Since you are given limited characters, you will need to make every letter count. So what should your text ads look like? For starters, the text ad is one of the places where you can insert a relevant keyword so that the person will see that the ad may have something that’s important to what he searched for. Next, it should catch the attention of the viewer, stating why he should click. It could also have a call to action that will encourage him to click and view your landing page. Of course, you have to ensure that your text ads are truthful. Only put there what the client expects. Nowadays, Google offers tools that will help you create your text ads. These tools are noted for their ability to guide you in making compelling texts that will catch the attention of searchers. Features include being able to use ad extensions that show additional information about your business website, such as contact details, sitelinks and more. You can see ad extensions in action on the picture above as well. With PPC, your goal is to get a high click-through rate or CTR. In simplest terms, CTR refers to the number of clicks your ad gets for every time your ad is shown and seen by searchers. 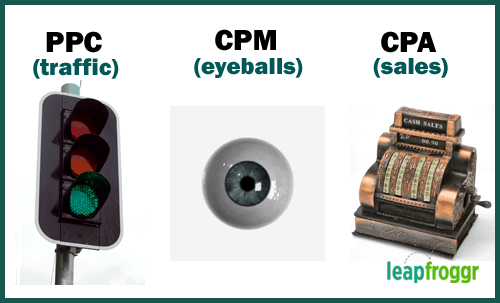 Fortunately, today’s PPC tools already have features that will calculate your CTR for you. Your CTR will often be visible on your account’s dashboard. Why should you care about your CTR? Basically, your ad’s click-through rate affects your quality score, and you’ve already learned how important quality score is to get you an ad spot on the SERP. With both high quality scores and high click-through rates, the cost that you pay for ad spots will eventually get lower. Aside from this, your CTR will give you an idea on how much traffic your page is getting, particularly your landing page. On the other hand, a high CTR doesn’t always mean good news for your business. What if your ad keywords are not relevant to what people are searching for? People might click on that ad, and when they find out that your landing page does not contain what they want and need, they will immediately go to other websites. They might dismiss your site as insignificant and your site won’t produce sales. Using the wrong keyword on your ad is especially bad since you are paying for each click of your ad. High click-through rates are beneficial if these clicks are giving you profit and if your product and brand are selling. That is why using negative keywords is advised for marketers. That way, you won’t be in any danger of getting high CTRs for the wrong reasons. In essence, a high CTR means being able to target the appropriate keywords for your ads and also getting the right people to click on those ads. You’ve learned the importance of optimizing your keywords and ad texts to increase your quality score and click-through rates, wherein both factors will affect the visibility and cost of your ad. However, the number of people who click on your ad and spend time on your website won’t be as significant if they do not convert. In this case, converting means executing your desired and expected actions, such as sharing a link on their social network profiles or buying your product. This leads us to the importance of conversion rate optimization or CRO. Conversion rate optimization refers to the process of optimizing the look and feel of your ads and landing page in such a way that you enhance the user’s experience. As a result, your chances of making a profit increase. How do you optimize these things? First of all, you need to create ads that will get the attention of the searchers. PPC ads already have an advantage because they appear before the organic results. Still, this should not stop you from optimizing your ads to entice people to click on them. Using specific and the right keywords will help you get the people you’re targeting. Next, you need to make sure that the content of your ad, particularly the context of the keywords, matches what can be found on the landing page. The landing page is basically the page people will be directed to when they click an advertisement. Your landing page should contain the relevant information that people looked for earlier via the search engines and keywords. If they don’t see what they were looking for, of course they’ll leave. It can be annoying for consumers when your ad doesn’t link directly to the item being advertised. You also need to spend time in the overall design of your website and each of its pages. You don’t necessarily have to go all out in decorating these pages. You just have to make each of them look interesting, which will entice the people to spend more time navigating through the pages. You have to consider the different options that Google has implemented over the years. You can use their Site Links option to show your add accompanied with 4 other links to important pages. To supplement your local SEO, you can use the Call button option where mobile clients can see your ad when searching and call you directly by tapping on the Call button. You Can Call Directly On Your Phone By Clicking The Ad! Nice Feature! Google’s Display Network is another way for you to make use of PPC further. It can help you acquire more eyeballs and brand recall because it reaches websites all around the internet. Ever went to a blog and saw a square or rectangular ad on the side? That’s most likely from Google’s Display Network. Someone bid on that spot so it’s showing their ad there. Here in Asia, you might have seen blogs use NuffNang. Finally, you have to make time for testing your ads and your landing pages. This is just to make sure that your ad does point to the right landing page whose content will be relevant to the searched word. It’s possible for you to try out multiple ads at once to get an idea on what ad in the group works best. For example, if you test four ads at the same time, an ad network like Google can rotate it evenly to show you which one actually works better. Also, you can learn from the examples of the style that your competitors use to do their ads. A lot of them have been there for years so they know what works. Note: The market is ever-changing. Ads that have worked before, along with variables like keywords and such, might suddenly not work any longer. This is why companies have managing fees and why it’s important to keep testing these ads. There is something called Remarketing or Retargeting today. Ever felt that a brand is stalking you? Maybe you visited their website recently and every site you go to now has their ad on it? Even on Facebook? That’s what remarketing is. PPC or Pay-per-click marketing is one of the methods of marketing that will help drive traffic to your page. This is done by using ads that will be placed at the top of the SERPs where people are most likely to see and click them. 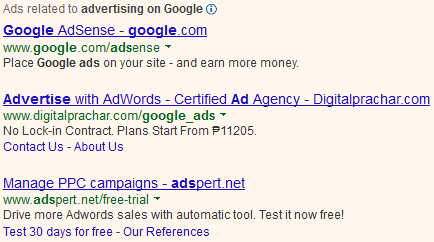 Creating your ads is free, but you have to pay for the coveted spot on the SERPs. There are two ways by which you can know how much you need to pay for your ad, particularly for the clicks that your ad gets, namely: flat-rate model and bid-based model. The flat-rate model refers to the fixed cost per click agreed upon the advertiser and the publisher. In the bid-based model, advertisers need to bid against other advertisers for the ad spot and the price of the ad. Getting an ad spot doesn’t necessarily spell success. You need to engage in the optimization of your ads and your website to increase the conversion rate of people who have clicked on your ads. The conversion rate depends on how your landing page will maximize the user experience of the person, but more importantly, the conversion rate greatly depends on the effectiveness of the ads to get those clicks from the right people. To determine the effectiveness of your ads, it’s important for you to test these ads and see how they will work on several ad networks. You can test multiple ads simultaneously to determine which one will do better in the group, and thus, you can use that one as your PPC ad. With PPC, the process is simple. You need to create an advertisement that will target specific people with specific needs using specific keywords. The more people click on your ad, the higher the click-through rate (CTR) will be, and the higher the CTR is, the higher the quality score is. The higher the quality score, the lower you pay for your ads.